This course may very well be the most important course a paralegal student can take, simply because it is in the area of litigation that attorneys rely most heavily on their paralegals. This course will provide students with a comprehensive understanding of the major aspects of civil litigation, from both the plaintiff’s and defendant's perspectives. The course will focus on a variety of subjects aimed at teaching the student how to manage a case from beginning to end. The subjects covered in the course will include determining jurisdiction and venue; initiating and commencing a lawsuit; client counseling; investigation techniques and the discovery process; the drafting of summons and complaints, motions, briefs and pleadings; settlement techniques; the trial itself; pre and post-trial activities and the appeals process. This course will also offer an intensive but simplified introduction to U.S. legal systems and methodologies, basic principles of stare decisis and precedent, the nature of legal education, and sources of law. Topics include: The judicial structure, including both federal and state; statutes, regulations, common law and constitutional law; synthesizing sources of law; the judicial process and the doctrine of stare decisis; overruling precedent, holding, rationale, and dictum. The key component of the paralegal’s role in civil litigation is drafting documents. Therefore, this course will also focus on training our students to do competent legal research and develop their ability to draft legal documents. Students will learn to identify and use a variety of research tools, including both the online collection provided by LexisNexis® as well as traditional book-based methods of legal research. A portion of the course will focus on the various types and form books of reference books, proper case citation, cite checking and the proper method of case reporting, shepardizing, methods of compiling legislative histories and administrative legal research. 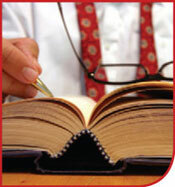 Research legal issues in any jurisdiction. Navigate through online law libraries, i.e. LexisNexis. Cite appropriate authorities and legal sources. Distinguish between "binding" authority and "persuasive" authority. Determine valid case law using "Shepards." Assist in writing a persuasive legal memorandum. Apply the rules of venue in both federal and state jurisdictions. Describe key elements of various civil pleadings, i.e. complaints, answers, etc. Understand various discovery mechanisms & their appropriate usage. Apply the rules regarding admissibility of information obtained through the discovery process, in a court of law. Describe basic rules of trial procedure. Describe basic rules of evidence. Determine the appropriate appellate court to which a verdict can be appealed. Describe the standards for review appellate courts use in various situations. Describe the requirements for certification of a class action suit. Determine whether a class action is appropriate in various hypothetical situations.